The role that solar energy can play in not just the total energy mix of the U.S. but also job creation has been addressed in a number of recent studies all of which project strong but varied rates of growth. But much of the assumptions were based on past levels of government support in the U.S. for the solar industry, which has since dried up. The employment reports also don’t take into account recent events such as the May 17, 2012, announcement by the U.S. Commerce Department to impose tariffs on solar panels imported from China – a move that may slow employment growth for solar installers. Addressing the World Renewable Energy Forum in Denver on May 16, U.S. Secretary of Energy Steven Chu called on Congress to act on extending clean-energy tax credits, which he said would help American companies create jobs and produce clean, renewable power. "America can't afford to miss out on the clean energy opportunity," Chu said. "We have an opportunity to create a second Industrial Revolution that will provide clean energy and put us on a path to a sustainable world." Before the tariffs against China and while the federal government was still aggressively funding solar power, the U.S. had experienced a near doubling in annual installed solar capacity between 2009 and 2010, which doubled again in 2011. Many of those installed PVs were made in China. 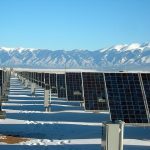 A number of long term annual growth projections for solar have surfaced that range from 4.8 percent to 25 percent offering the solar industry “a boost to employment in the U.S,” according to a May 1, 2012, report from the Center for Public Policy at the University of Tennessee. The study examined historical and current federal incentives in energy markets, comparing those incentives along and the speed of energy technology adoption. In considering the growth expectations for the domestic and international solar markets, the Center analyzed the solar industry’s U.S. job creation and solar power’s potential contribution to addressing peak-demand power needs as well. The report, “Assessment of Incentives and Employment Impacts of Solar Industry Deployment,” estimates that the U.S. solar industry could employ hundreds of thousands of Americans by the end of the decade. “Depending on the assumed growth rate in solar deployment, we estimate between 200,000 and 430,000 total jobs related to domestic growth in the solar industry (direct, indirect and induced) in 2020,” notes the University of Tennessee’s report. According to the University of Tennessee’s definition, direct jobs are those related to the solar industry while indirect jobs are those generated by the purchases made by the solar energy industry. The University also estimated the worldwide installed solar capacity and projected potential employment by the U.S. solar industry from future solar exports assuming a positive trade balance. “Depending on the growth rate, we estimate the solar industry will provide between 240,000 to 965,000 direct, indirect, and induced jobs by 2030, taking into account the productivity improvements that will occur over time. The export potential for U.S. solar manufacturing and materials provides potential benefit to the economy, as would the additional 67,700 direct, indirect and induced jobs that would be added to the existing solar industry employment by 2030 if the U.S. maintains its share of the solar market,” concludes the report. In August 2011, the National Solar Jobs Census 2011 identified 17,198 solar employment sites and 100,237 solar jobs in all 50 states, up from roughly 93,000 the previous year. The majority of these jobs are in solar panel installation and their maintenance. At the time, the numbers represented an overall job growth rate of 6.8 percent, nearly 10 times higher than the U.S. national average employment growth rate of 0.7 percent. But the Solar Census, rather than using the standard industry employment statistics, surveyed the solar firms to identify the number of people that spend at “least 50 percent” of their time on “solar-related activities” rather than using the concept of “direct” employment. Those estimates were then scaled up to provide an employment total. Because of this, the Solar Census numbers have taken some heat from both those who feel they are inflated and others who believe the numbers might actually exclude some jobs that might be considered solar employment. “It should also be noted that the solar industry has historically produced more jobs per megawatt-hour than any other energy industry,” notes the Center for Public Policy at the University of Tennessee. That conclusion is based on work done by the University of California at Berkeley’s Renewable and Appropriate Energy Laboratory (RAEL) which recently examined 15 job studies to create its “Green Jobs Calculator.” The calculator estimates the number of jobs that might be generated from renewable energy based on the success rate of state Renewable Portfolio Standards in the U.S. by 2030. Based on their data, investments in PV capacity generate more jobs per megawatt capacity than any of the other energy technologies, amounting to 7.45 to10.5 jobs per megawatt of installed PV capacity. RAEL found that coal created 1 job per megawatt and natural gas 0.95 jobs. 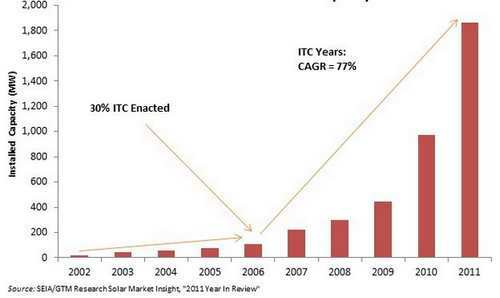 2011 was a momentous year for U.S. solar energy with the installation of 1.7GW of PV. According to the Solar Energy Industries Association, the U.S. market share of global solar installations grew from 5 percent in 2010 to 7 percent in 2011, the largest market share for the U.S. since 2007. 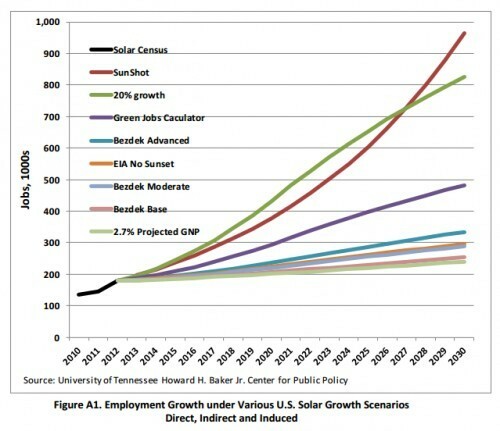 This, in turn, spurred not only solar job growth but projections of a rosy job outlook for the future. In fact, despite the collapse of companies like Solyndra, Evergreen and SpectraWatt, the U.S. is still regarded as one of the strongest global PV growth markets. But those increases in capacity and employment numbers were boosted by government loans and incentives that are no longer available, as well as a steep price drop in PV panels which may also have peaked. Some within the U.S. solar industry feel they may have got a shot in the arm when the U.S. Commerce Department imposed tariffs May 17, 2012, ranging from 31.4 and 249.96 per cent on PV panels imported from China. While some U.S. solar panel makers support the tariffs, others fear raising tariffs on imported Chinese panels could raise the prices and diminish demand by potential customers since Chinese PVs hold a 50 percent share of the U.S. market. The CEO of SolarCity, one of the largest PV panel installers in the U.S., told reporters that the tariffs may a "massive impact on jobs" because most U.S. solar jobs are "focused on the delivery" of PV panels rather than their manufacture. In 2011, only about 25 percent of solar jobs in the U.S. were in manufacturing compared to over 50 percent in installation. Other job decreases are feared to take place among domestic firms responsible for manufacturing nearly 45 percent of all the inverters sold in the U.S. as well. With the different future solar employment estimates for the U.S. all based on a past performance that was propped up by government incentives, it will be interesting to see how flat even the most conservative estimates fall. The fact that the U.S. Secretary of Energy Steven Chu called on Congress to extend the clean-energy tax credits a day before the government announced import tariffs on PV panels from China indicates both a disconnect between agencies and the possibility of movement toward re-establishing some form of incentives – a move that has historical precedence in the U.S. The May 1 report from the Center for Public Policy concluded that the incentives provided to the solar industry were consistent with incentives provided in the developmental stages of virtually all other types of energy sources that the U.S. federal government chose to incentivize for public policy interests in the past. While short term domestic political policy changes in funding can take glowing industry studies of established employment trajectories and make the projections worthless, even small changes in international solar policy can have major employment implications. When the U.S. government announced in March 2012 intentions to impose duties at rates ranging from 2.9 to 4.73 percent on crystalline silicon PV cells imported from China, the amount of those duties was dismissed as meaningless. But on May 18, the U.S. Commerce Department announced these proposed “anti-dumping” duties would range from 31.14 to 249.96. Over 61 Chinese companies were named for the 31 percent duty while the others will be subject to a rate closer to 250 percent. 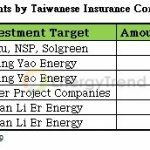 However, since the duties only apply to PV cells and not to the modules that contain them, some mainland Chinese manufacturers still plan to sell to the U.S. market with cells from sources such as Taiwan, which is not subject to the proposed tariffs. The fact that executives from Suntech, Trina Solar, and Suzhou-based Canadian Solar, have all admitted they currently use PVs from outside the Chinese mainland for their modules to avoid the proposed tariff should help ease the prospect of a sudden decline in demand due to price increases in the U.S. And since the U.S. Commerce Department’s final decision as whether to actually go through with imposing these duties isn’t scheduled to be made until early October – less than a month before the U.S. Presidential election – there is a chance that unemployment pressures from U.S. solar companies that oppose the tariffs could change the outcome of the Commerce Department’s final decision.